Discoveries continue at Pompeii as more electoral inscriptions, fine frescoes, and victims of the eruption of Vesuvius are unearthed, offering snapshots of public and private life in the Roman city. We take a look at some of the finds so far. In Pompeii’s Regio V, a large-scale excavation is under way on a wedge of land between the House of the Silver Wedding and the House of Marcus Lucretius Fronto. The area has seen some archaeological work in the past, but not for several decades. Using modern techniques, a multidisciplinary team is now reinvestigating the site in more depth as part of the two-year Great Pompeii Project. The skull of this man was found later at a lower level than the rest of his body, having been displaced by the collapse of a tunnel below. The skull suggests that he was not, as first thought, crushed to death by the block but rather asphyxiated during the pyroclastic flow. As with previous excavations at Pompeii, remarkable colourful frescoes have been found. Near the House of the Silver Wedding, the excavated fronts of houses boast particularly fine wall-paintings depicting cupids and vegetal motifs. In one domus, the walls of the entrance are decorated with frescoes featuring, on a red background, architectural elements and various animals, above all a pair of dolphins that lend their name to the newly discovered building: the House of the Dolphins. It is not just domestic interiors that are revealing themselves as work continues. The team have also identified some noteworthy external features, such as in the ‘Alley of Balconies’, so-named for the four balconies discovered here, along with the upper floor of a building. Out on streets like these, the Pompeiians would have gone about their daily business, visiting premises including a recently excavated unit thought to be a small fullonica or laundry. Also in the public sphere, the political aspirations of individual inhabitants can be seen in the well-preserved electoral inscriptions that were painted in red and black on external walls. One calls for votes for Helvius Sabinus – a good man worthy of public office, we are told – as aedile, while another endorses Lucius Albucius for the same post. These inscriptions are written on a surface prepared with white paint, perhaps to cover up any previous notices. 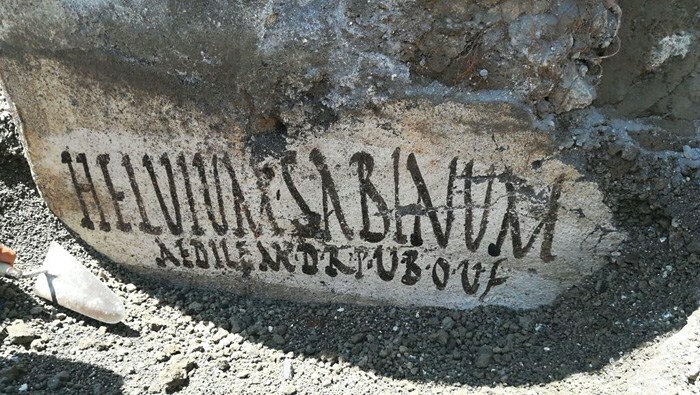 An inscription calling for the election of Helvius Sabinus as aedile. The names of these men bring us close to the people who lived in Pompeii. So too does the poignant discovery of human remains at a crossroads along the Alley of the Balconies. The skeleton is that of an adult male, over 30 years of age, with lesions on his tibia caused by a bone infection that would have hindered his escape. 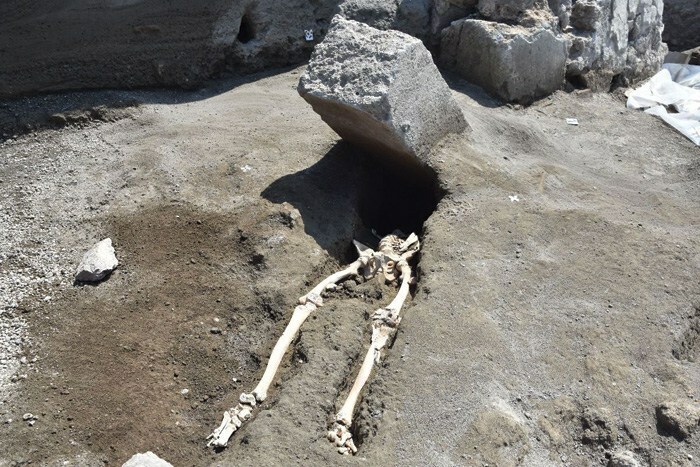 Archaeologists found the man’s remains in the alley at first-floor height, above the lapilli layer, which suggests that he survived the first phase of the eruption, only to be asphyxiated during the pyroclastic flow. His upper chest and skull were later recovered from a lower level, having been displaced by the collapse of a tunnel below. As the excavation progressed, archaeologists found the man was clutching a small pouch to his chest. Inside were coins. Research is ongoing, but an initial assessment has identified 20 silver denarii and two bronze asses, enough for a small family of three to live on for about two weeks. Pompeii rightly remains popular with tourists, but also attracts attention of a less desirable kind. Carabinieri and archaeologists have been working together to investigate looting north of the ancient city walls in Civita Giuliana, where suburban villas are located. Last year, they intercepted looters’ tunnels, built following the outline of the rooms of one villa, causing damage to the walls and plaster. The resulting excavation to save the at-risk villa identified a suite of service areas belonging to the large complex. Parts of the building and its contents are remarkably well preserved: even a fragment of a wooden bed has survived, along with amphorae and kitchen utensils. 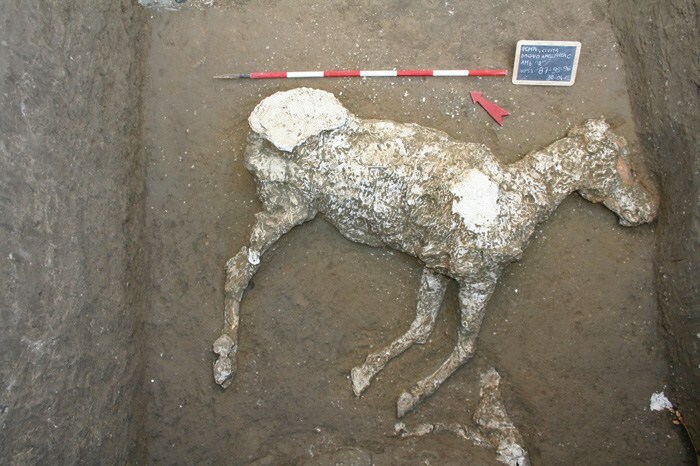 For the first time in Pompeii, a cast has been made of a horse. The animal was found lying on its side in the villa’s stable. The height to its withers is about 150cm, a considerable size for an ancient horse. With valuable iron and bronze fittings found around the skull, this tall steed must have been prized by its wealthy owner. The cast of the horse at Civita Giuliana.